Such a good vibe - booked 2 nights and stayed for 5 coz once you arrive you can’t really leave. Awesome stay and Tequila shots are insane. 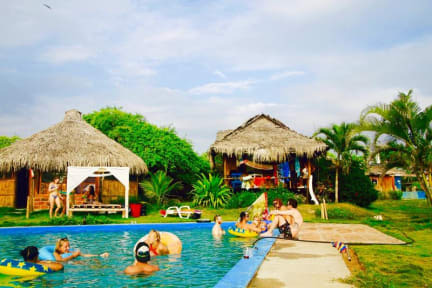 Best hostel in South America! Such a great social vibe! Staff and volunteers are amazingly friendly. Food is amazing- you won’t want to eat anywhere else. Drinks are reasonably priced. There’s something going on every night so it’s super easy to meet other travelers. Location is about 20 mins walk from town, but it’s nice being away from the bustle of montanita. And the hostel is literally right on the beach. 10/10 hostel. Thanks Kamala for an awesome time! One of the best hostels I stayed in! The WiFi might be poor and the rooms a bit hot but the vibe is killing it! Highly recommended, would have loved to stay longer. Amazing atmosphere, really good food and fun activities the staff can organise for you, especially the day trip to the island. Awesome location right on the beach too! Recommended by word of mouth for good reason. This place has one of the most fun party atmospheres in South America. It is easy to spend too long here. You are on the beach and there is sand everywhere so embrace that the price to pay is an environment that is not sterile. On the whole would advise everyone to spend at least a few days here. I loved the vibe and had a great time at this hostel. I only really have two issues. First, this hostel uses an absolutely outrageous amount of plastic- right next to the ocean. I think they go through over 100 straws a day. Also, the pool is not cleaned often enough.